France midfielder Steven Nzonzi have signed a long-term deal with AS Roma. The 29-year old moved to the Serie A side from La Liga club Sevilla for an initial fee of €26.65 million. The deal also includes a number of performance-related clauses, on the part of both the player and the club, that could be worth up to an additional €4m. The former Stoke City midfielder agreed a four-year contract with the club that runs until 30 June 2022. 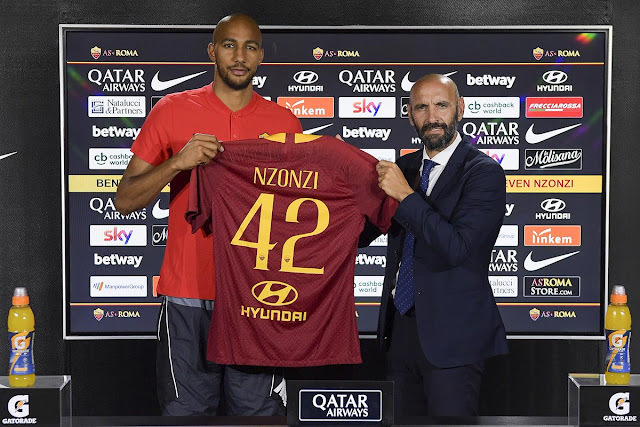 "I feel very happy to be here, and to be a new Roma player,” Nzonzi said. A powerful, combative central midfielder, Nzonzi was a significant part of the France side that won the World Cup in Russia this summer. He played in five of the team’s seven games – including 35 minutes as a substitute in the final as Les Bleus held off Croatia to lift the trophy. At club level, Nzonzi has spent the last three years at Sevilla – becoming a dependable presence in the heart of midfield, with his form helping his club lift the Europa League in 2016 and subsequently earning him international recognition for the first time in his career. Moving to Roma sees him unite once again with Monchi, the sporting director who initially brought him to Spain. “Steven is a footballer with a mix of physical and technical qualities that we think will really add to the players that we already have here,” Monchi said. After starting his professional career in France with Amiens, Nzonzi went on to spend the majority of his formative footballing years in England – representing Premier League side Blackburn Rovers and subsequently Stoke City. In total he has nine caps for France.